I've now listened to the entire debate, every minute. I'll probably listen to the whole thing again. My goal is to be objective with this analysis. To start, I would far prefer James White over Bart Ehrman. For me to be objective, I couldn't have a horse in this race and be fair. I've debated twice---once for one night like the Ehrman-White Debate and second for an entire week of nights. I had an online debate about a year ago. I've coached debate a little. I taught a class on rhetoric once and logic twice. I understand that the two men were debating the proposition: "Do the New Testament Texts Misquote Jesus?" I don't think the NT texts do misquote Jesus. However, I wasn't the one debating Ehrman; White was. At the end of the debate, with complete objectivity I would have to say, "Yes, based on what I just heard, the New Testament texts did misquote Jesus." Only Ehrman was really debating that point. James White seemed to want a different debate topic---whether the degree of error in the NT text would result in denial of the inspiration of Scripture. Some that read me here aren't going to like what I am saying. However, I say, listen to the debate yourself and make your own decision. I know what I heard. I don't know how anyone could conclude otherwise. As a matter of fact, I think if someone comes on here to defend a White victory, he doesn't understand debating. He's also letting his beliefs and his like and passion for James White get in the way. I would love for someone to slay Bart Ehrman. In a very small sense, James White did. Even though he plainly lost this debate, he did take some shine off of Bart Ehrman's point. He did expose Ehrman as a deceiver with an agenda. He cleared up some matters for which a majority of evangelicals would be happy. However, that wasn't what this debate was about. White knew it wasn't supposed to be about inspiration. During the debate, Ehrman made it clear that he had agreed to do the debate with the provision that the inspiration issue wouldn't be the proposition. It seems that White brought it in against his own pledge not to do that. White didn't have a chance to win this debate right from the very start. He shouldn't even have debated that proposition. Why? There was no way he could refute what Ehrman was saying because he agreed with Ehrman's position, at least as far as the debated topic goes. 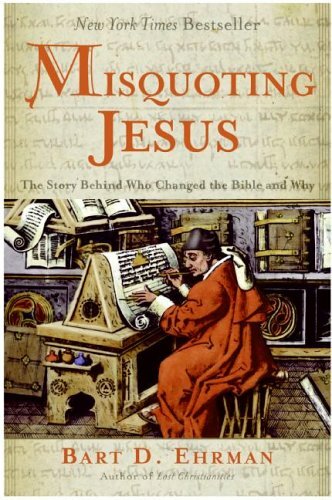 Ehrman said that he had nine propositions in his book, Misquoting Jesus, and that James White agreed with him on 8 1/2 of them. It was true. James White agreed with almost everything that Ehrman said in Misquoting Jesus. James White didn't attempt to refute that. Why? Because James White too believes that the New Testament misquotes Jesus. He loses the debate right there. He's supposed to be arguing against it. Ehrman was not arguing for a theological position. It is true that White brought up the theology and then Ehrman addressed it. White then said that Ehrman always brings it up in debates. Ehrman swatted this aside by explaining that he always talked about it because his opponent in these debates always brought it up. White had no answer for that. At the most, all that White wanted Ehrman to admit was that Scripture was more reliable than any ancient manuscript, essentially on the same terms as those manuscripts would be considered to be reliable. That wasn't even what this debate was about. Ehrman admitted that, but that was something that we already knew about Ehrman. True, he doesn't go all over the country defending Scripture. True, he relishes the reason why the secular world loves him and quotes him so much. But he isn't afraid of saying what he thinks. He wasn't trying to hide his skepticism or his disbelief. I think he was willing not to make too much of his own particular point. He says that he doesn't know what the originals were. That's something White will not say, even though it is what he thinks too. White got caught on his reliance on textual critic as authority. He quoted Aland in agreement with him on the issue of the reliability of the New Testament. He was depending on Aland's expertise, viewing himself as not an authority, which was true. White hadn't studied the manuscripts himself. Ehrman one-upped him by telling him that very few textual critics believe what Aland does anymore. Ehrman exposed this about White by asking him if he knew who the foremost critics were in Germany and France. White acted like this shouldn't matter, when it was he who opened up the door of authority-by-critic. White cherry-picked his critics and then Ehrman started naming the critics that he knew. And White himself acknowledged that Ehrman himself was one of the foremost critics in the world. Ehrman manifested White's death by a dozen critics. The critics agree with Ehrman, oh, except for the evangelical ones. They don't. Men like Wallace don't. Why don't they? Not because of the evidence, says Ehrman. He made a big deal about that. Let me explain that one point, that was interesting. The evangelical textual critics say that textual variants don't matter. They repeat regularly that they don't matter. Ehrman points out the obvious. If they don't matter, then why is it that Wallace is spending hundreds of thousands of dollars running around cataloguing and photographing manuscripts? Good question. Ehrman asks in essence, "What does he tell his sponsors, those funding him? I'm doing all of this because it doesn't matter. Of course he doesn't tell them that, because they do matter! Why check for all the variants and look very carefully at all of them if they don't matter?" I agreed. The textual critics don't think that the text matter is settled. James White speculates that we've reached about as far as we can go in NT textual criticism, that is, unless we have another Dead Sea Scroll like find. So on the one hand, the evangelical textual critic says the variants don't matter and then on the other hand he is saying that they really, really do matter. Ehrman succeeded in the debate at showing, if one believes that a particular variant might be a part of the originals, that it really can change the meaning of the text. Since they were ultimately not debating the topic because White in essence conceded that point to Ehrman, then we got a discussion about other matters. A major part of the conversation was about how reliable are the manuscripts we possess in replicating the originals. Ehrman made this argument: "The early scribes weren't very good at copying. They weren't trained in it. So they made a lot of errors, and that's why we see so many mistakes in the earliest manuscripts." White agreed on this point and added his own---"they didn't have scriptoriums" and "they were on the run from persecution." That only played into Erhman's hands. The earliest manuscripts, both agreed, are from around AD220, about 150 years after the book was complete. I think it was P45. Anyway, the further back we go, Ehrman argues, the worse the believers were at copying because the less trained they were. Therefore, if the oldest copies that we have, which are copies of copies, then how far off was the copy that made that copy and then the copy that made the copy from which that came from. He says that there is no way for us to know what the originals were, based upon that. You can see how that with that theory, the more recent textual critics could reject inspiration, not even think about inspiration. You can see how that they could develop into this kind of unbelief. White's explanation for that, said in exasperated tones in his final statement, was postmodernism. There we go. These men are a product of postmodernism and that's why the new textual critics have a greater degree of uncertainty than the earlier textual critics, which had only a lesser degree of uncertainty. My heart couldn't be warmed by his reassurances for why this was happening, even with the condescending exhalations. White had a come-back for this textual theory. It was very involved. He assumed that Ehrman couldn't understand it. As a result, he spent a great deal of time explaining it again, eating up most of his rebuttal, ripping on Ehrman for not understanding (mainly because he didn't read White's book, sigh, such lack of preparation). Oh, Ehrman understood. That wasn't clear to White, but it was clear to me. Ehrman just didn't believe in White's textual theory. White's theory was something like this: "You've got an old copy of Scripture from the fourth century. Then you've got a later copy that looks very much like it. It comes from a different line. You read two different lines and they both agree closely---this agreement gives evidence of what the original text is." White also does a computer comparison using his home pc, comparing the TR with the Nestles Aland, and between those he finds great agreement, so that too shows the tenacity of the text. The text is there. And then on top of that, Kurt Aland says that it's there, so it must be there, because he is a renouned textual critic that knows several languages, is indeed no hick. That's the essence of the White argument. Ehrman has a come-back for that. He says that the agreement of the later text simply means that it was copied from the earlier text. That's what that means. How do we know who is true on this? I don't think we do based only on textual criticism. You've got to take your pick between the two if you're going to decide based on textual criticism. White exposes Ehrman in at least four ways. They were all good for evangelicals who care if they know for sure that they have all the doctrines and at least 93% of the text. One was one that Ehrman has said already, but he doesn't like to repeat it too many times in public, that is, that the NT text has more textual attestation by far than any text from antiquity. In his review of himself, White says that we should put that on t-shirts for college students, as a quote from Ehrman. I thought, "That would be funny." Then I thought, "That would be just like a modern evangelical. Witness by t-shirt with clever statement." I also thought, "What a weak statement. 'Our Bible has less errors than Socrates does!! It's God's Word!!'" Anyway, I give that point to White. White also made Ehrman say another thing that he has written but that you don't normally hear from him. He made him say that we can't conclude Scripture isn't inspired from the evidence. It could be. God could have done it that way. Ehrman made no conclusion about inspiration except that He didn't believe in it. He didn't say that it wasn't true. Third, White did flush out from Ehrman that he quotes other ancient books as if they had been preserved, even though there is far less evidence that they have been. A humorous moment took place at that juncture when White asked Ehrman in cross examination about the length of time between the writing of the book and the earliest copy that we possess. Ehrman had said a humonguous period of time in terms of copying. And so compared to Tacitus and other ancient works, whose earliest copy is much further away in years? White asked Ehrman to give a word to describe that length of time, to which he answered that it was gi-humonguous, or something like that. Very funny. You got the sense that Ehrman really did believe in the preservation of these other books with their lesser textual evidence, indicating a theological bias coming through. In fairness to Ehrman, even though I hate the work that he does, he has a higher standard for text that comes from God than White does. White acts like any of us should expect errors. I think it is White's Calvinism---God wanted errors in the text because of the greater good there would be (something like that). The reason Ehrman, it seems, is willing to trust Tacitus more than the Bible, is because Tacitus doesn't claim inspiration or preservation. The Bible does. Last, James White showed how that the variants in the manuscripts that we possess do not really get rid of doctrine. They may change doctrine in a few places, which White concedes. But the variants don't change the essence of the meaning of the text of the New Testament. White exposed this aspect of Ehrman. I do believe that Ehrman had to believe he was toying with White. White was like the boy who put together a lot of airplane models arguing against the engineer from Boeing. Ehrman is a textual critic. He has examined the actual manuscripts. Ehrman is one of the few men in the world who are called in to examine a recent archeological find. When they dig up something old and significant, Ehrman is on speed dial. White isn't in the phone book. Ehrman got his degree from Princeton. White got his from a P. O. Box. I don't care about those kind of things too much, but when we talk about textual criticism, these credentials are a big deal. Ehrman was on the recent discovery of the copy of the Gospel According to Judas. White doesn't get called in on those kinds of assignments. Daniel Wallace is at least doing big boy manuscript work that even Ehrman must recognize. James White is the little train that could. He's actually quite a big train, but that's beside the point. "Please give me scholarly respect" oozes out and drips all over him. You don't have to try to see it. He constantly brings it up. I guess, to be nice, we're supposed to ignore it. I know it's gotta be hard for him to feel the disrespect he thinks is there. Christians should get accustomed to it. They're not going to get accolades. But he says things like, "You didn't even read my books. You said your book was the first book on textual criticism, but I (throat clear) was actually the first with my textual critic book, The King James Version Controversy, used at Podunk Hollar U. and School for Basket Weaving." Ugh. That is not a text on textual criticism. Come on. He wrote his own review of his debate (which is quite revisionist in my opinion) that starts with "I was riding my bicycle up South Mountain, a 7 mile long ascent with portions hitting a 12% grade." What did that sentence have to do with anything! Then when he gets a bad review from American Vision and he writes his own review of the review, coming across as desperate. Again, I know it's tough, but these kinds of things don't aid his cause. Almost all critical text evangelicals talk and talk about how they are mistreated. In White's commentary on the debate, he says that the people there were really surprised at how poorly Ehrman treated him. I listened to the whole thing. I didn't hear it. I thought Ehrman treated White with great respect. He brought in the textual critics question only because White had opened the door for it with his dependence on Aland for his point on the tenacity of the text. White also presented an argument during his cross examination, slipping it in with a sarcastic tone to his voice, sounding as though he knew exactly what was doing, even though that is a no-no during the cross. Ehrman is far more consistent in his theological expectations of Scripture than White is. Ehrman knows what verbal inspiration is. He knows how that is tied into authority even by evangelicals. He also knows about the promises of preservation. He knows what the Bible says. He assumes that if the Bible is inspired, that God could make sure that they got every Word, that God could also preserve every Word. It seems that Ehrman understands that presupposition better than White. White has been saying that he is a presuppositionalist in his after-debate defenses. Maybe he is. I didn't catch his presuppositions. I only heard a Scriptural argument seep through a few times. Once he mentioned that the NT writers thought that the Old Testament was inspired. He could have mentioned Peter's reference of Paul in 2 Peter 3 if he wanted to get a little more presuppositional on inspiration (although this wasn't what the debate was about). The one that he mentioned more, I believe, blew up in his face like the coyote with the road runner, and that was Jesus' quoting the Old Testament. White tried to use that as a defense for mistakes in the text. He said that Jesus quoted a corrupted text of the Old Testament, so a corrupt text is obviously not that big a deal. Ehrman latched right ahold of that argument. He said, "Yah! Some of what Jesus quoted from the Old Testament wasn't even in the Old Testament!" From that exchange, I thought that White's main presupposition defended Ehrman's proposition quite well, that is, it doesn't really even matter if the New Testament misquoted Jesus. After all Jesus misquoted the Old Testament. How does that buoy your faith? Overall I thought Ehrman had a better handle on the authority of Scripture than White. He saw how that errors in the Bible take away from its certainty and authority. That was enough for him to push the eject button on Christianity. White argued using what he saw as the best evidence. Based upon that, he leaves us with uncertainty on the text. He doesn't care if there are errors. He even argues for errors, like that is a scriptural position. You can mainly see this from White in how he argues the issue. White's goal is to show that the Bible is better preserved than other ancient works. Since those works are considered reliable by scholars, then the Bible should be seen to be even more reliable, enough to believe. But what he does is this---he drags the Bible down to the level of the other books. He approaches preservation like other ancient texts, using scientific laws of textual criticism. What we see is that those laws actually change. Modern textual critics see themselves as objective. They think that the evidence leads them to conclusions. They think they are being honest with them. But they start with the multiplicity of the manuscripts as the basis of their conclusions. Hence, they reach the wrong conclusions. Christians should be reaching their conclusion from Scripture and then going to the manuscripts. But you have no textual critics starting with a scriptural bibliology. They do not begin with biblical presuppositions. This affects their outcome. As sad as it could get in the debate, White couldn't muster up a defense of the historic position on preservation as seen in the Westminster Confession and the London Baptist Confession. He couldn't explain a scriptural position on preservation, perhaps because he doesn't even know what one is. He hasn't given it enough thought. He has been so busy reading Bart Ehrman and Dan Wallace and Bruce Metzger and Kurt and Barbra Aland that he hasn't sorted through the passages in scripture on preservation and their historical understanding, reading Turretin and Owen and others. I might have more to say about this later. Then again, this might be it. I'll probably come back with something if I learn anything new that I want to share. You could listen to it yourself. It was interesting to hear, as sad as it was. By the way, I just saw tonight, before I about called it a day, this article on the White website by Alan Kurschner. In other words, I had my actual review posted for several hours before I noticed Alan's article. Alan and I lived about one block from each other for ten years back in Watertown, WI. I actually wouldn't take anything back from my article yesterday about the debate. Anybody reading it could see I was talking about the McDurmon article mainly. Everything else was based upon what I've heard, read, and watched of White. Well, if he cares, now he's got something to read. I doubt I'll call into the show, but I would debate James White anytime on this subject. I can see that what comes with it is the post-debate spin room to manage people's perceptions of what happened. You have the debate. Use it. However, regarding Alan's little article, there are several misrepresentations (to put it nicely). I'll just name a few, because I need to get to bed. 1) When I said "the skeptic," Alan put Ehrman in parenthesis. Well Alan, I wasn't thinking of Ehrman, but "the skeptic," as in the generic use of the singular noun. If I was referring to Ehrman, I would have used a pronoun. So you can take that back. 2) I don't believe that God preserved His Word in a 1611 Anglican translation. (Quite a few of the translators were Puritans by the way.) 3) He says I'm a fundamentalist. Anyone who has read even a little of me knows that I am not one. 4) I never said that the best material would be Ehrman's skepticism. I said his content in opposition to White. Alan. Again. Isn't it White that says that you know someone is losing the debate when he becomes inconsistent. You, my friend, need to check out your accuracy. By the way, isn't the point of reading a review to read it before you watch something as a means of seeing if it will be worthwhile? Come on, Alan. brother, you do realize that you're not going to hear the end of your saying, "but I would debate James White anytime on this subject?" White and his loyal fans tend to not let those things get away. So I look forward to hearing that debate. Want to understand the level of these guys' work? He calls me a bigot. I'm a bigot, according to James White, because of my accurate review of his debate. I can only guess that he doesn't provide a link to this post because he doesn't want people to read the context of the quote. There's James White for you. How does he argue with my post? 1) He uses ad hominem mainly. 2) He misrepresents my "mindset" in the very title. I have scriptural presuppositions. That's my mindset---something James White would do well to get. 3) Then he attempts to smear me with the Muslim tag, like he tried to do with Bart Ehrman. 4) He, like many others, broad brushes all King James men into the same position, a convenient strawman. 5) This is the worst, that is continually repeated. That I expect a variantless text. I've never taken that position. I believe there are textual variants, as did the Westminster divines. James White doesn't care to argue the real issues. This above is a joke of a debate tactic. If anybody wants to believe it, they're mind-numbed sycophants. I've got no special feud with James White. I usually expect that to be a tact taken by his side. They do the same thing when I talk about Dan Wallace, that I've got something personal. Here's what I've got: respect for what Scripture says on this position. We need to be warned about the Bart Ehrmans, yes, but also about the James Whites. A good discussion of this subject was started on the PuritanBoard and was then, of course, shut down by the moderators and administrators (the Masoretic/Received Text Calvinists at the PB are very knowledgeable debaters on this subject which is why White, a member of that board, studiously stays away from them; and the Critical Text championing mods and admins and other members routinely get bested in the numerous debates, in fact the most respected members of that board have the Masoretic/Received Text position, i.e. they are seen as the 'adults'). I know you, Mr. Brandenburg, are not a Calvinist, but since White is you might find the links above interesting from that angle. Thanks Puritan. If you read John T. Christians History of the Baptists, he says that Baptists historically were more Calvinist than Arminian. That would characterize me. On this issue I'm surely more Calvinistic in the truest sense than Mr. White. Thanks for the links. I've conversed with Mr. Weddle. Interesting read. When I found out these two men debated, I knew White would have trouble defending his point. (I base this on his view of preservation.) I think it is sad how White tried to valiadte the Bible by comparing it to other ancient books. How can one agree to debate on this topic and leave God out of the equation?! It is after all his Book! I, however, do not believe either man believes it is God's book. Both agree it is man's work with mans errors and therefore can not be trusted 100%. They just seem to differ as to what level in can be trusted. If White's view is correct, than Ehrman's view is acceptable. If God did not preserve it all for us today, why believe any of it as God's word. (After all, if an Almighty God, was going to provide His word, why would he not preserve it 100%.) By following both men's view, we are left with man's opinion as to what is truth and what is not truth in the Bible. What a weak god both believe in, which is unable to preserve His own Words. One question for you. You said you are not a Fundementalist. Why? I agree Terry. As to why I'm not a fundamentalist. We put a lot of time on that in our last month of Jackhammer, so if you read my articles over there, I explain. However, in a few sentences, fundamentalism is an interdenominational movement that emphasizes too low a common denominator for me to be associate with it. The church and unaffiliated Baptist is good enough for me. First, clearly James White would lose such a debate, because he was essentially debating against his own position of textual corruption and uncertainty. The worst debate must be one where you pretend to argue against yourself. "The critics agree with Ehrman, oh, except for the evangelical ones. They don't. Men like Wallace don't." It is hard to see Wallace as really any different from Ehrman. Wallace takes a veneer of White-style pseudo-evangelicalism yet also has a total dedication (more even than White) to the confused no-pure-tangible-Bible views of modern textual criticism. And Wallace is a big Ehrman booster, even complimenting him on Jesus being "angry" in Mark 1:41. The only real difference between the two is that Ehrman is consistent with the results of following the paradigms and tenets of modern textual criticism, while Wallace is inconsistent. "Modern textual critics ...start with the multiplicity of the manuscripts as the basis of their conclusions." Modern TC is specifically designed to override the multiplicity based on what Aleph and B say, as the prooftext MSS. While you likely realize and agree, the above could be misunderstood. Hi Steven. Thanks. I purposefully used multiplicity of the manuscripts. I know it's used as a technical term, but the CT guys will say that they believe God's Word (singular) is preserved in the multiplicity of the manuscripts. They don't mean the majority text. They mean all the manuscripts, but with emphasis on the oldest. Mr. Avery, you're very impressive on these subjects. You're like Kent too in being even tempered. I've read your writing on other forums. I like some of your phraseology too. The modern version industrial complex (that may not be your exact wording so I won't put it in quotes). The Critical Text scholars and their various "products." Using the word "product" is helpful too because we can point out that the CT scholars put out more than one product, don't they? They like to associate themselves with the ESV and NASB, which is bad leaven enough, but at the other end of their product spectrum are some very strange Bible versions indeed. >Modern TC [textual criticism] is specifically designed to override the multiplicity [of manuscripts] based on what Aleph [Sinaiticus] and B [Vaticanus] say, as the prooftext MSS. This is true, and it is clear White is using his darling Vaticanus and Sinaiticus as his standard without admitting it. Maybe he just does it unconsciously without ever having to think about it. A strange standard based on the fact that they - I'm told - disagree with each other so hallucinogenically. I'm not certain, but I think I also heard White make a statement in his Dividing Line broadcast with Robert that seems to stake out new ground for him. It seems to me he is now saying the Textus Receptus is *absolutely* a worthless text, or the Byzantine line is *absolutely* worthless. In his King James Only book it seems he tried to say the usual, "Don't get me wrong, I think the King James Bible is a great and wonderful thing..."
There is also a revealing portion of one of his Dividing Lines where he recites a trip he made to the British Museum that houses ancient manuscripts and books, and he gushed over seeing Vaticanus (or Sinaiticus) behind a glass case, then he stated he, in so many words, was made to feel sick when he walked further on and saw and original Authorized Version 1611. I am paraphrasing, but the impression was made like that. I am not up to speed with the type of discussion you are all are having. Do you study the scripture as if it is perfect? How do you describe the scripture that we have today? Did God preserve his word? Any simple breakdown would help me alot and I would appreciate your time. James White got pawned in this debate with Bart Ehrman. I think this debate has allot of people rethinking positions. This blog is also quite excellent in giving the KJV case. So far I have seen James White debate twice on defending scripture. Once against a Muslim apologist Shabir Ally and the 2nd against an Agnostic Bart Ehrman. I was not impressed with his 'case for the scriptures'. Total disaster. Hence his blog and radio program clean up crew. If Someone Has This Debate,Can He/She Send It To Me?I Am Dying To Listen This Debate ! 1:48am at night trying to learn and replying on a subject matter I have no educational background at all. I started watching debates on Islam vs. Christianity. Those are easier to decipher/review and make my beliefs in Christ stronger. However, since White does indeed profess Christ died for our sins and is Gods Son wouldn't it be better to use more constructive means to criticize? I mean, we are all in the same boat aren't we? I am not the intellect I wish I want to be in knowing all the information you all possess. I have to rely on my faith and beliefs from reading that no matter what Erhman says I wont change. I am glad though that you people know so much more and hope that someday you can join together to help defeat people like Erhman etc. May God Continue to Help You All help me learn! !